This is a custom back plate with induction charging circuitry that [Derek Hughes] build for his HTC HD2 cellphone. When we checked in with him last week he showed us how to add an inductive charger without voiding the warranty but it wasn’t very pretty because the stock back plate blocked the inductive field and couldn’t be used. The solution he came up with will work with any device if you want to put some time into the build. He took two different aftermarket cases; one fits his cellphone and the other is a BlackBerry case meant for housing a credit card. After cutting a hole in the back of the cellphone case he epoxied the credit card holder in place, smoothed the seam with Bondo, and repainted. Not only does the charger fit in the credit card case, but there’s still room for a credit card. [Derek] also measured the magnetic fields around the circuitry and found they will not damage the magnetic strip on that American Express Black you’ve been keeping on you. In the video after the break he mentions the last step in finishing this case will be to locate a 90-degree USB plug as the current connector is a bit of an eyesore. [Derek Hughes] wanted to use inductive charging on his cellphone without voiding the warranty. 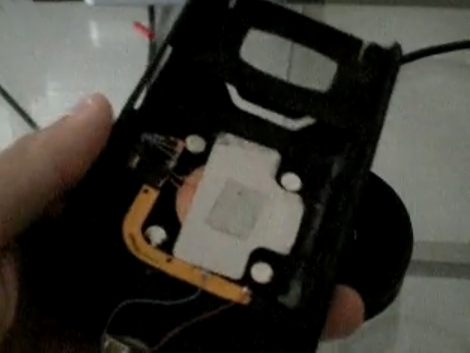 He picked up a Pixi charging backplate meant for a Palm Pre and scavenged the coil and regulator circuitry from it. To make the electrical connection with his HTC HD2 he removed the mini-USB plug from a charging cable and connected it with 30 gauge wire. The whole package will fit beneath the back plate for use with a Touchstone charger (as we’ve seen with the HTC Evo) but there was one problem. The metal backplate from the HD2 interferes with the inductive charging. For now he’s using tape to hold everything together while searching for a plastic case replacement.